I found some cool textured paper in my craft bin, so I decided to make these! Somewhat hard to do, I'll admit. I also had an Apollo one, but I doubt it would fit. cool! can't wait to see your apollo one! Thanks! I might sneak the Apollo in a future pic if there's some empty space. Oh, I've done this before with characters from Rudolph the red-nosed Reindeer The textured paper looks fantastic! Very cute! Oh, that sounds so cute! Thanks a lot, Leirin~! Awesome Aero. I don't know why but when i see you Paper Dolls i remember my times in the primary school, i surprise those times. Always your work is amazing Aero, i like how looks all but more Gooey and Batty. If you want you have the permission of make ones of my characters of KTCG or KAA in paper, but only if you want. Again, this work is awesome. I hope see more of the Paper Dolls, keep it up, my friend. Also, a question: ¿How you make them, you cut the paper or twist it? Thanks, Kiroscarby! You might be reminded of your primary school because of my somewhat childish style. 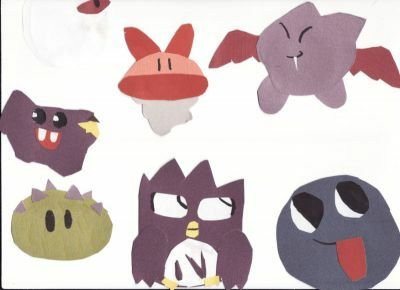 Also, I most likely would make some of your KTCG characters, but I used up all of the paper making these! To make them, I cut them and glued them. Thanks again~!